Which Came First the Tiger or the Jayhawk? 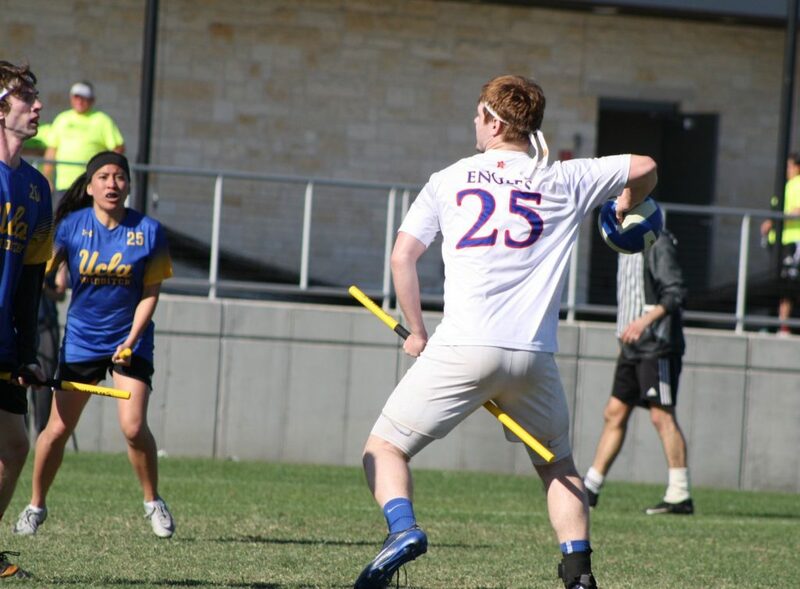 The University of Kansas versus the University of Missouri is one of the most celebrated rivalries in quidditch. 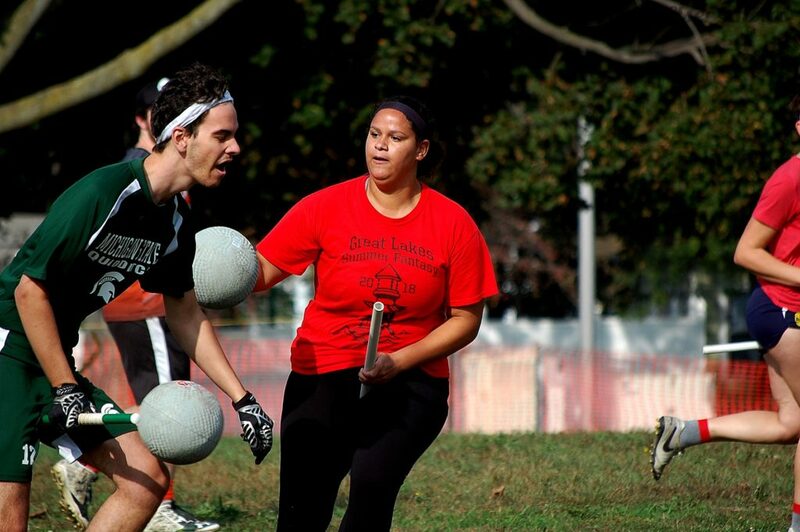 They have competed in six official games in the past three seasons, all in snitch range, and two of which took place at the 2016 and the 2017 Midwest Regional Championships. Overall, Mizzou is winning the series 4-2, with one win being earlier this season, and three wins in 2016. Kansas won both games played last season, one of which was a nail-biting overtime championship at regionals. Overall the two have had very similar trajectories: when the Tigers won the regional championship in 2016, they went on to make a Final Four run, while Kansas lost out in the Sweet 16. But when the Jayhawks won the regional championship in 2017, they made the Final Four run while Mizzou instead bowed out in the Sweet 16. This year Kansas started the season ranked third in The Eighth Man Media Rankings, on account of losing few pieces from last season. Mizzou was unranked due to the huge loss of Jacob Parker and David Becker, leaving what many thought to be a void in their depth. However with a solid recruiting class, and several players such as beater Justin Dewick and keeper Cole Jost stepping up in Becker and Parker’s stead, the Tigers have had a very promising season. Mizzou has proven itself, with a snitch range game against Twin Cities Q.C. and with the win over Kansas earlier this season. That has brought the Tigers to its current seventh place ranking, while the Kansas dropped to sixth after a disappointing season opener without Rachel Heald, Brandon Tabor, Ryley Andrews and Adam McMorris. However, Heald and Andrews will return to Kansas for the first time this season while Mizzou continues to adapt to the loss of Parker and Becker;this weekend could decide who has the best chance at reaching the Final Four, or maybe even the finals, in April. Will the Boom Train Ever Come? This season saw the creation of Boom Train, a team mostly sired from the past two Indianapolis Intensity squads. With pieces from multiple states, this team has become the Midwest/Great Lakes super team in the stead of Lake Erie Elite. Starting off the season ranked No. 10 by The Eighth Man, Boom Train had high expectations–especially after they moved up to seventh after convincing wins over Mizzou. However at Midwest Warm-up, Boom Train had to pull the snitch for overtime and again to win against Twin Cities Q.C., and Boom Train was even down 50 at one point in the game. This begs the question: Is Boom Train the real deal? Either Boom Train is just another middling club team that is over ranked or Twin Cities is under ranked. Twin Cities does have Josh Zemke and Cody Narveson, two experienced beaters who will anchor a much less experienced but otherwise athletic beater corps. Max Meir and Terry Carlson have taken more responsibility with the quaffle this season, choosing to drive and shoot in chaos. Defensively, Twin Cities has only become better, utilizing Alex Obanor at point,and Cavonte Johnson as a utility player, with Sean Adams and Matt Bessard providing tall, physical defense in the paint. For Boom Train, Nathan Digmann and Nathan Ellert run the offense,led in by the likes of Matt Brown, Marisa Enos and Jeremy Hoffman. With the absence of Jeff Siwek, Cammy Lang will be starting at seeker after going four for five in catches two weeks ago in Jefferson, WI. If Brown and Hoffman can give her enough time, Boom Train could come away with their first regional championship. Twin Cities will have to defend its regional title against a team they’ve had a snitch range game with, something they have never done before. And Boom Train will be vying not only to win, but to prove they deserve their current seventh place ranking and assert themselves as the best team in the region. This year the Midwest gets two club bids, almost guaranteeing Twin Cities and Boom spots at nationals. However, this means there’s a chance for the third place team to receive an at-large bid to nationals. If Brew City Warriors or Chicago United Q.C. get broze at this tournament, it could mean their first trip to nationals. Brew City has benefited from the addition of players like Eric Corey and Matt Dwyer to bolster their roster of mostly Marquette University alumni. It could be enough to overpower the growing, but still inexperienced, Chicago United. Chicago United will have the largest roster they’ve ever had at a regional championship, and it could pay off in a bid. Expect Eric Lunde and Scott Rein to be the main scorers, following Austin Pruyn and Hannah Mueller’s lead at beater. If they can integrate Amy Zasadzinski into their offense, Chicago United could see themselves in Round Rock in April. With the pool format of the tournament, it’s easy to see that Kansas, Mizzou, The University of Minnesota and Creighton University are almost guaranteed the top four seeds in the bracket. As long as they hold seed, they should easily come away with bids. After the first four, it’s almost a complete toss up. The second and third tiers of the Midwest are far separated from the first, but are very close together in talent. Getting fifth seed at this tournament will be instrumental for a team trying to get to nationals. As long as they hold seed against an eight seed after losing their play-in, they’re also guaranteed a bid. The sixth and seventh seeds become a little harder to sort out as they play each other for the bid, then the loser gets thrown into a tertiary bracket where the game becomes a war of attrition. If a team is trying to steal those sixth and seventh bids on day two, they’ll need to stay injury free and minimize their losses to maintain decent seeding on day one. Marquette, Illinois State University and Southern Illinois University-Edwardsville are all primed to share spots five through seventh, giving them good chances to receive bids. However, Illinois State is the most volatile of the teams and they could easily see themselves upset in the tertiary bracket by a lesser team riding the hot hand of a player or two. Last season, Jessie Slepicka carried the University of Northern Colorado to a bid, leaving in his absence a team who has only won two official games this year. This is just a testament to how instrumental one player can be when attempting to secure one of the last bids to nationals. This season, that all-star could be Caleb Manns, a freshman at Illinois State University. In just his first month, he’s shown such tremendous growth to become the best quaffle player on his team and the second best beater after a three-year veteran. With a high likelihood that the last three bids will be determined by snitch grabs, Illinois State needs a player like Manns to constantly keep the Firebirds in range so seeker Will Collins can catch for a win, and hopefully, a bid to Nationals. Manns’s ability to follow his beaters to sink mid-range shots makes him a threat on the pitch and a player that can carry Illinois State to Round Rock in April. The Mid-Atlantic has a plethora of bids available. With 20 teams attending in the college division, every other team is going to punch their ticket to Texas. Sadly, this means that no team that can make waves on the national level is going to have to fight for their bid, greatly dropping the tension of the whole weekend. Last year, only seven of the 15 teams from the region to get bids made brackets between college and community; one team received a bid after winning only game. While it is unlikely that this Mid-Atlantic Regional Championship will be as low-stakes as last year, it will still be unexciting to outside observers. For the top region’s teams, this is all a formality; the Terrapins and Cavaliers are more worried about how to find the best brisket in Texas, than how to earn their spot there. The Mid-Atlantic regional trophy has only had three owners in the past six years. University of Maryland has held the title for four of those years; with an undefeated record against college teams this year, and an in-range game against a highly-ranked community team, the Terrapins are likely to add a fifth regional title. Their only flaw is a weak seeker game, allowing for long games that tire their roster and give their opponents ample time to catch up. Look for Maryland to push hard on the quaffle game early, to give their seekers some breathing room. Maryland is looking at the University of Virginia as their biggest competition, their rivals from last year’s finals but a team that has been somewhat inconsistent this year. 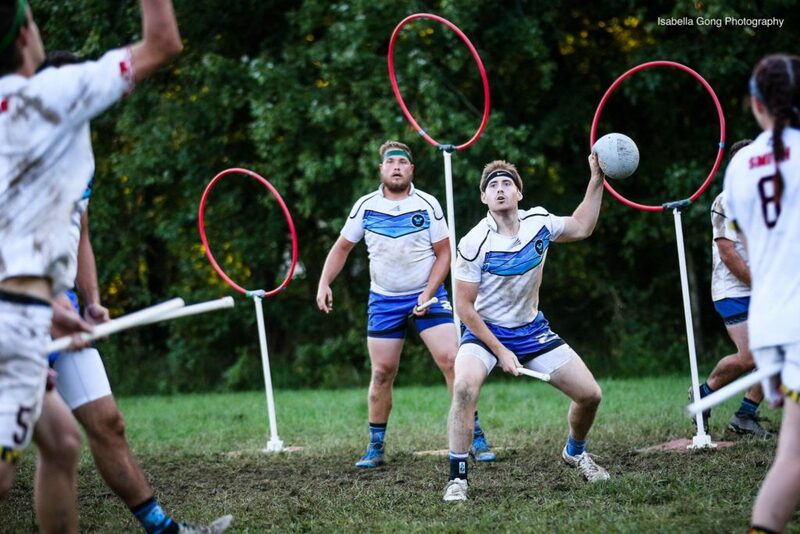 At Acromantula Cup, they put up an amazing fight against Maryland during snitch on pitch, that had them go on a 50-10 run, but they also barely beat James Madison University at the same tournament. Depending on which team shows up on Sunday, Virginia could put their name on the trophy. Apart from these two powerhouses, the only team that stands out is the out-of-region invader, Ohio University. With several wins under their belt, this team comes in with confidence, but has not been tested against any top teams. It is hard to say whether they will be able to hold up under pressure. Any other teams that appear as contenders would be a major surprise, but that is not unheard of in a region that has played with electric fences as hard boundaries. The dark horse teams would have to pull away from the middle of the pack: Virginia Tech, James Madison, George Mason University, Penn State University and Duke University. While few would argue that any of these teams are better than the three above, with a bit of luck and strategy to exploit the weaknesses of the top dogs, they could knock someone out of brackets. Consider these teams as good as locked to take bids home, with University of Richmond and Lock Haven University predicted to round out the ten teams headed to Texas. While the college results are all but decided, the community bracket has only one certainty: a New Jersey team will take home first. The Warriors are head and shoulders above their competition this weekend. Led by Michael Parada and Amanda Dallas–still in the glow of their win as the USNT coach and coordinator, respectively–The Warriors feature a higher skill ceiling and more depth than any other team. Their beating corps boasts massive variety in styles—from Jason Rosenberg’s steamroller plays to Benjy Strauss’s more conventional moves. Finally, they likely have the best non-male chaser squad on the East Coast headlined by Lindsay Marella. To summarize: there is not a team in the Mid-Atlantic that can touch them. Worry not, though! Spectators will still be treated to the other four competing teams scrambling to take the final two community bids. Of the remaining teams, Philadelphia Freedom Q.C. and Southern Storm have little to show competitively for the season; Philadelphia took losses to both The Warriors and DCQC and Storm competed far south of any major competition. That being said, both of these teams are fielding full rosters which is more than can be said for the other two. Terminus Quidditch Atlanta only has 14 players currently listed on their roster, and DCQC is struggling to find non-male players to bring to what may be the most important tournament they attend all year. With these roster issues, it may not be a matter of skill but endurance that decides the fates of these teams. DCQC has higher-skill players at almost every position than the other (non-Warriors) teams, but with only two non-male chasers and no beaters they will be heavily restricted in how they field their roster. Due to the gender limitations, DCQC is extremely vulnerable to forfeit by injury. Terminus also has some skilled players like Sean Pagoada and Lee Hodge, but their short roster puts them in danger of exhaustion. If these teams can keep going all weekend, I expect them to take the bids over Philadelphia and Storm. But, with attrition predicted to close the skill gap on day two, it will likely come down to tiebreakers to see who gets the bids. Utility player Aiden Mossip has quickly taken to the game, making smart plays and wielding a good arm to impact both offense and defense. Of all the tournaments Virginia has attended this year, he has seen just as much play time as the team’s veteran beaters; at Oktoberfest, he was the sole male beater–a huge responsibility for a player at only their second tournament. And he rose to the occasion; Virginia only had one loss that day, in range, and to the tournament finalists New York University. Morris’ beating is only half his value, however, as he has also stepped up as one of the team’s more productive seekers. With several catches under his belt, he is a powerful weapon especially when Virginia’s biggest rivals struggle to quickly catch the snitch. Every game that Morris can end early will give his team more energy for the next opponent, and will help him look past the pool play games towards performing and progressing at brackets. An extremely-skilled and physical rookie in a region that doesn’t see a huge amount of tackling, Knippel falls to an honorable mention only because he is one of many quality chasers on the Maryland roster.